Reposted from The Forum of Fargo-Moorhead, July 23, 2017. Richard Boulger immigrated from Ireland during a potato famine and found his way to the bustling prairie town of Fargo, where he became established in the hotel business. For years he ran the Hotel Boulger at 223 Broadway, the corner of Broadway and Third Avenue North, which previously was home to the Exchange Hotel, in the heart of a fledgling downtown. In the 1880s, when Boulger arrived, Fargo was brimming with opportunity, enjoying a growth spurt after its founding in the 1870s as a prairie village of tents and huts. The 200 block of the east side of Broadway was home to a series of hotels and shops over the years, as Fargo evolved from a frontier town into a regional rail hub, banking and trade center. 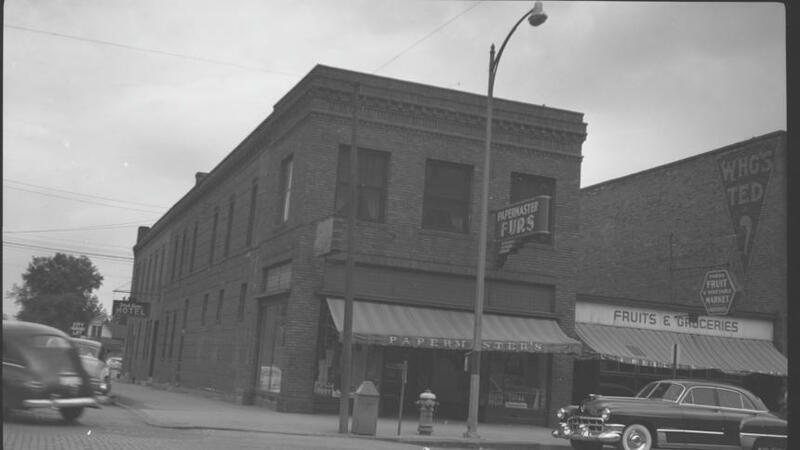 Papermaster Furs, shown here in a photograph from the early 1950s, was in 223 Broadway, which in its early years housed the Hotel Boulger. The brick building was built after a fire in 1893 destroyed much of downtown Fargo. Isadore Papermaster’s father was a rabbi who immigrated from Lithuania. Photo courtesy of NDSU Archive. At the southern end of the block, a brick building called the Keeney Block teemed in the 1880s and 1890s with small businesses, including sleeping rooms, a real estate office, Western Union telegraph office and a Turkish bath — a precursor of the suburban shopping mall. 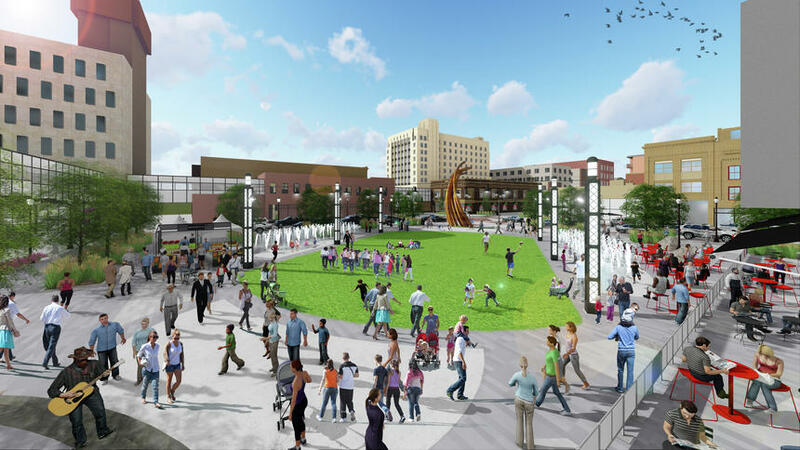 But in recent decades, the once-bustling east side of Broadway’s 200 block has been largely vacant, home to parking lots and the plaza for U.S. Bank. But that prominent blank spot in the heart of downtown is poised to be transformed. The 200 block of Broadway is seen Friday, July 14, 2017, in Fargo. It is the planned site of the Block 9 tower. Construction is slated to begin soon on the Block 9 tower, a $98 million project that, when announced, was envisioned to rise 18 stories tall. Developers have said the multi-use tower will include offices, high-end condominiums and a hotel. 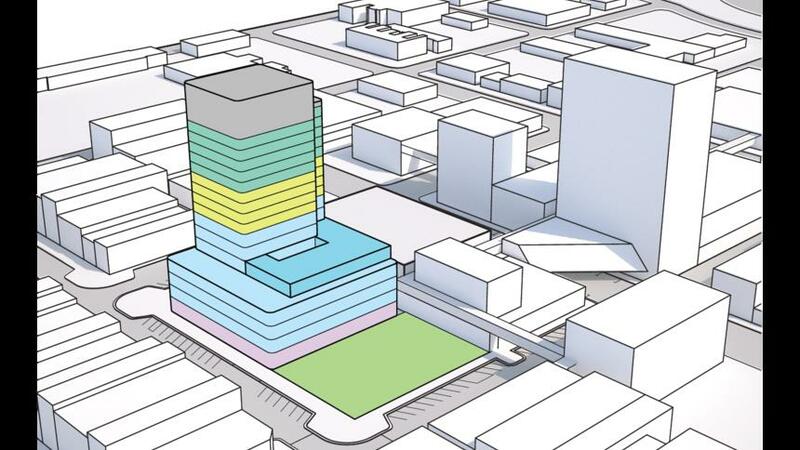 A 2016 diagram of the Block 9 tower proposed by developer Kilbourne Group. Special to The Forum. In other words, it would become a vertical version of the old Keeney Block, a brick edifice built in 1882 at a cost of $80,000, a bastion of commerce located at Broadway and Second Avenue North. The building was developed by Gordon J. Keeney, a lawyer from Michigan who was one of Fargo’s pioneers, serving as its first postmaster and later as a Dakota Territory U.S. attorney. To reach Fargo, he crossed the Red River on a raft. Signs visible in a photograph of the Keeney Block taken in the early 1880 indicate it housed the Fargo Furniture Co., Miller’s Music House, Freeman & Putnam, purveyors of crockery and glassware; Harwood & Wilson real estate, Spalding & Templeton, attorneys at law, and a dentist’s office. In the middle of the block, at 213-215 Broadway, one of the pioneer merchants was William O. Olsen, who ran a furniture store that originated in Moorhead. Earlier he’d farmed using oxen. His other enterprises included part ownership of a Norwegian-language newspaper. Olsen walked for miles up and down the Red River Valley hawking subscriptions. Although Olsen would remain in business for more than half a century, his move to Broadway was ill timed. He arrived in 1893 — shortly before the “Great Fargo Fire,” which swept through the downtown and beyond on June 7, 1893. 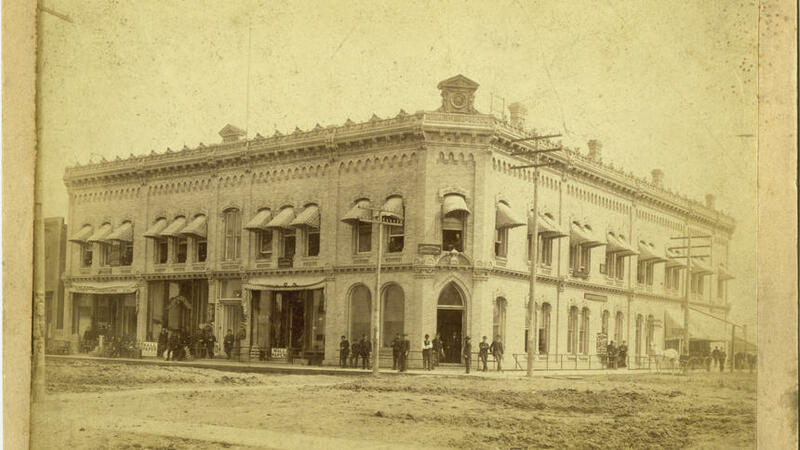 The Hotel Boulger and Keeney Block also were destroyed in the fire. Boulger watched helplessly as his hotel went up in flames, which turned most of the downtown into smoldering cinders, according to his great-great grandson, Larry Boulger. The fire started in a dry goods store on the 500 block of Front Street, now Main Avenue, where the Bank of the West now stands. Fanned by stiff southerly winds, the flames spread north and east, often traveling along wooden boardwalks, reaching Broadway. 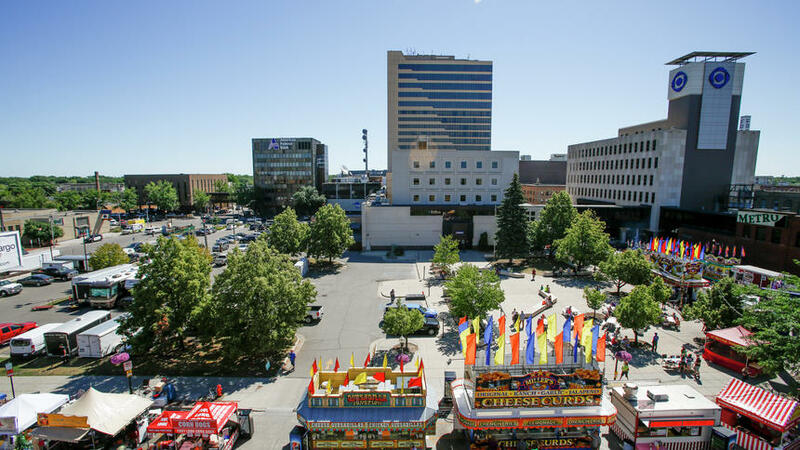 The fire proved to be a catalyst in modernizing downtown. After the fire, builders turned to brick and spurned wood. Wooden sidewalks were banned and the city adopted stricter fire codes. “The Fargo fire reshaped it,” said John Hallberg, an archivist with the North Dakota State University Archives. By November 1893, in the midst of a rebuilding boom, the transformation was well under way. After the turn of the century, by 1910, when the city’s population reached 14,331, streetcars were traveling up and down Broadway alongside the horse carriages. It wouldn’t be long before cars and trucks would take their place. 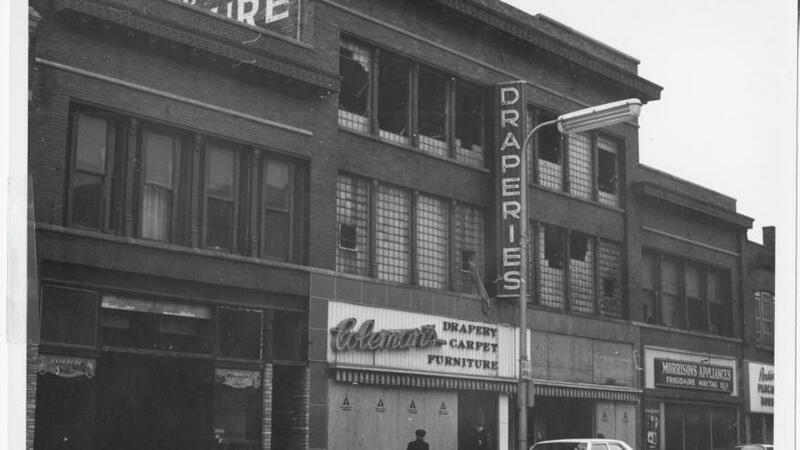 Boulger, Kenney and Olsen were among the Broadway merchants who rebuilt after the fire. According to stories passed down in the family, Richard Boulger owned two or three hotels in downtown Fargo, Larry Boulger added. Richard’s son, John, Larry’s grandfather, branched out into the funeral home business in 1897. By 1910, Hotel Boulger had become Norden Hotel, and Richard Boulger died the following year. A bigger change was in store for 223 Broadway. By 1928, after decades as a hotel, the building was home to Model Clothing House. By the 1930s, the former Keeney Block was now the Continental Block, 201-207 Broadway. A new facelift for the building in 1935 was heralded as “one of the greatest improvements to the appearance of Fargo’s downtown” in years. The Continental Block got another makeover in 1947, including the remodeling of one of its star tenants, the Five Spot Tavern at 205 Broadway. The $20,000 project featured “modernistic” decorations and fixtures, including an orchestra stand. 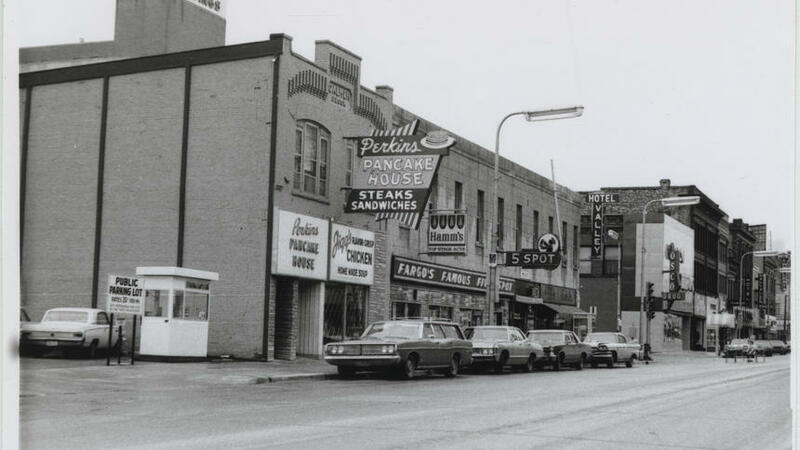 The Perkins Pancake house, shown here in 1968, occupied the Calmer Block, 209 Broadway, and Fargo’s Famous Five Spot Tavern, 205 Broadway, and other businesses. The buildings burned in a 1976 fire. Photo courtesy of NDSU Archive. In later years, the Five Spot would be known for its balloon night and for the western outfits donned by its wait staff. Still later, it gained notoriety for its go-go dancers. Inevitably, many buildings housed an ever-changing assortment of shops of the times. For instance, an address in the Continental Block, 203 Broadway, hosted the Shelbrook Cafe in 1928, a shoe repair shop in 1940 and, by 1955, Hobbyland and Broadway Figurine. By 1964, it was Iver’s Barber Shop. Fire would once again bring significant change to the east side of the 200 block of Broadway in 1976, when an arsonist torched the Continental Block, resulting in losses of $672,000 and destroying half a dozen businesses: Cripple Creek Bar, Tandy Leather Store, Barber Palace, Fortune Hotel, SKR Realty and Take 5 Lounge, a successor of the Five Spot. This photograph, taken in 1968, shows businesses at 211-217 Broadway. The block was in decline and never recovered from a 1976 fire. Photo courtesy of NDSU Archive. The 200 block of Broadway’s east side never really rebounded from the 1976 fire, which razed the Continental Block. Not long after, around 1983, 223 Broadway, the former Boulger Hotel, was demolished to make way for parking and the U.S. Bank plaza.